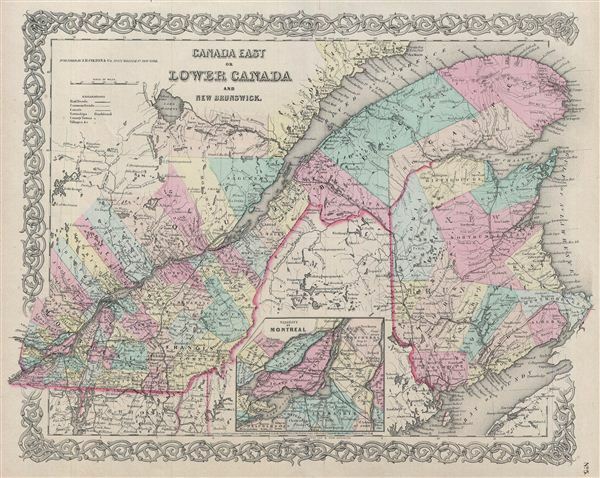 A beautiful 1855 first edition example of Colton's map of Quebec (Canada east or Lower Canada) and New Brunswick. Like most of Colton's regional maps, this map was derived from an earlier wall map of North America produced by Colton and D. Griffing Johnson. Following the St. Lawrence River Valley from Montreal eastward to the Gulf of St. Lawrence, this map covers what is today Montreal, Quebec, and New Brunswick. Canadian provinces and territories were under British and French control from the 16th century, until France gave up its claims in the Treaty of Paris in 1763. Canada would remain a collection of British colonies until its confederation in 1867, when the British Province of Canada was divided into Quebec and Ontario and the British colonies of New Brunswick and Nova Scotia incorporated as Canadian provinces. With the signing of the 1854 Treaty of Reciprocity between the United States and Canada, this area experienced a period of sustained growth and prosperity. The increased international trade that flowed into Quebec via the Hudson Valley inspired popular interest in the region. Montreal, Three Rivers, and St. Francis in particular benefited from the cross-border trade. This map also identifies various forts, rivers, mountain passes, fords, and an assortment of additional topographical details. Map is hand colored in pink, green, yellow and blue pastels to define state and territorial boundaries. Surrounded by Colton's typical spiral motif border. Dated and copyrighted to J. H. Colton, 1855. Published from Colton's 172 William Street Office in New York City. Issued as page no. 5 in volume 1 of Colton's 1856 Atlas of the World. Rumsey 0149.014 (1856 edition). Phillips (Atlases) 816.